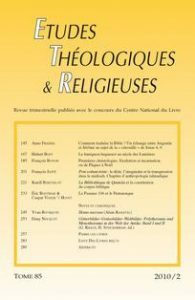 Jean-Marie AUWERS, Henk Jan De JONGE, éd., The Biblical Canons, Louvain, Peeters, coll. « BETL 163 », 2003. 24 cm. lxxxviii-717 p. ISBN 978-2-87723-651-5. € 60. Michael KNIBB, éd., The Septuagint and Messianism, Louvain, Peeters/Leuven University Press, coll. « BEThL 195 », 2006. 24 cm. xxxii-560 p. ISBN 978-90-429-1733-0. € 60.